Najwa Marsheh, 38 and her husband Issa Alchadaydah, 50 are quite possibly the most cheerful couple I have ever met. Najwa’s laughter regularly punctuates our conversation; her smile is broad and her eyes twinkle with happiness. Issa is a little more reserved, but happy and charming all the same. The couple recently moved to private rental accommodation in Lalor, but on this occasion they have come back to revisit Unit 109 at the Eltham Project which has been their home for the last seven months. Najwa and Issa were living in Syria’s capital, Damascus where they both had jobs that they loved: Issa was a Sales Manager for an import company and Najwa worked as a teacher in the Arabic language. For five years they lived close to the firefight between Free Syrian Army rebels and forces loyal to President Bashar al-Assad. They made the difficult decision to leave their family, friends and jobs, and fled to Iraq. They stayed in Iraq for eight months before arriving in Australia in October 2017. In January 2018, they signed a lease to stay at the Eltham Project where they felt at home almost immediately. Issa and Najwa have visited Canberra and Sydney and both agree that Melbourne is best. 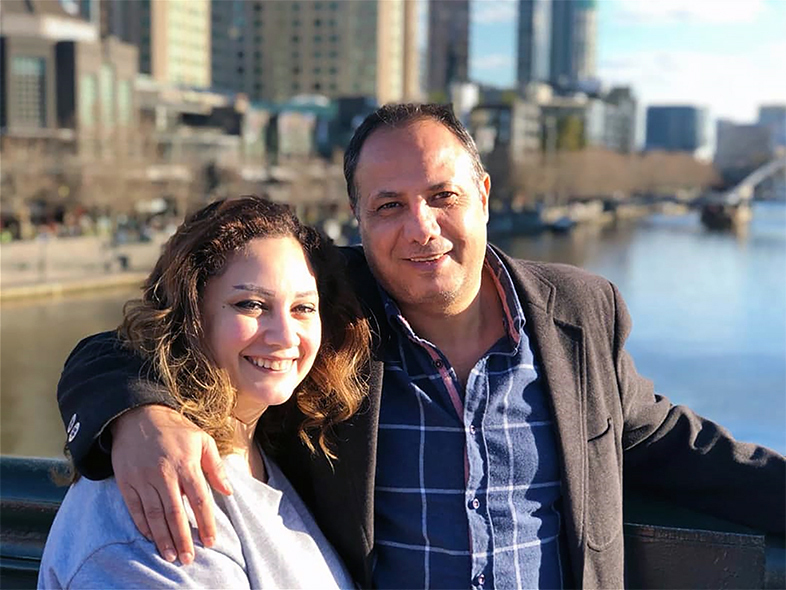 Najwa has started a course in Medical Administration and hopes to find work in this field, while Issa is enrolled in a course that will help him to prepare his resume and find a job. Both are also attending English lessons. For those of us who have grown up in Australia, it is almost impossible to imagine what it is like to live in a war zone. Daily bombings and explosions reducing your city to a crumbling ruin while the community around you is decimated by death and displacement. How many of us know what it feels like to abandon everything you have built and loved to start all over again in a foreign land? Exiled from their homeland, Najwa and Issa know. They lost everything and yet they have so much joy and hope. As they face their future with optimism, determined to build a new home in Australia, you can’t help but believe that theirs will be a life that is lived to the full.